Ok my first attempt is the symbol that looks like a triangle with a circle on top. I got that from the back of the book that linka you there. Second attempt is the symbol that looks like a tall mushroom. Third attempt was the circles. So far nothing has worked. How about another hint?? ...oh and, make sure you turn out that light. As you found in the previous puzzle, light can be distracting. Yes large round trees. I have the light off and I worked all the round circles and even the circles that have squares in them. Is there any jumping involved?? Say from one hexagon to another or off the floor?? You are way overthinking this one. You want the ones that actually look like trees. If you still can't get it, all I can do for you is draw out the solution. oh, and no jumping needed. I got the hexagon floor and moved on to the room with the hexagon lifts. I thought cloth #7 might be in the hole above that doorway bur the hexagon lifts only go as far as the steps. Then I thought the cloth might be on the back of the lifts and I didn't see them there. I even went back to the gallery and linked to the balconies thinking it may be somewhere else. Where else might I look?? I know there’s at least one beyond where you are now. Focus on solving the platform puzzle for now. Another visit to the Gallery might be in order. I'm still playing with the lifts. I brought up my photos of the gallery and I'm guessing the one with the colored bottles is what I need. I see 4 weights on wither side of the bottles and tried to make the lifts match those. I also tried it in order of the colors in the wheel i.e. red blue tan green. So far not hitting the right combo. Am I getting warm on this assumption? There are a bunch of symbols in a ring that are the same colors as the weights in the picture. Maybe they mean something? I'm back and still working on the lifts. The 4 weights in the stained glass match parts of the rotating wheel. All has 3 pieces in the wheel. Red is numbered 1-2-3. White is numbered 1-2-3. Green is numbered 2-3-4. Blue is numbered 1-2-4. Once I noticed that lift 3 and 4 went up at the same time but I haven't been able to do that again. Is that significant? I have only so many moves with the lifts so I the number combinations don't add up. I have the missing numbers; red #4 white #4 green #1 blue #3. I'm assuming this is the order in which you hit the levers; 4 4 1 3. I've tried levers left to right and right to left. Nothing changes in the lift room or in the stairway. I have even looked behind the stone door and nothing there either. So maybe the colors are not in the right order?? Ok, two things. One, I went and double-checked because the numbers seemed off, and you seem to have the wrong numbers. Double-check which numbers are for which color. Two, The numbers don't refer to the order you pull the levers. Assume that the picture in the gallery is a physical representation of the setup (Red is on the left and corresponds to the lever on the left, ect). Maybe the numbers refer to something else? You were right. I had the wrong numbers. I have now gone up the long ladder from the lifts to the next level and puzzle. Glad I'm not afraid of heights! Ok now I have 6 buttons to push to open the door ahead of me. The symbols look like the 6 things that spin in the gallery. 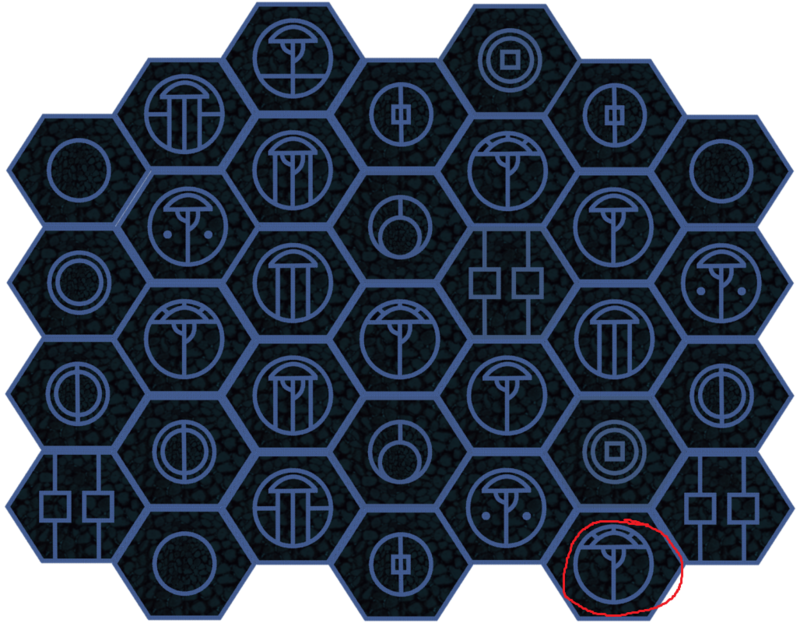 Or maybe the symbols on the hexagon floor? The 6 things that spin in the gallery are 3 sided and the symbols on the button panel are 4 sided. Is the sequence I need from the gallery?